We know it's tough, casting aside your identity as a stormtrooper and your entire life in the First Order, only to be asked to take up arms again and keep on fighting. You were totally hoping for a life of peace! But being part of the resistance means fighting the forces of evil, and you can't do that with good intentions alone (trust us on this one, because we've tried). Now's your chance to put your blaster skills to use for the good guys! For that task, you'll find no trustier sidearm than this Star Wars The Force Awakens Finn Blaster Accessory! 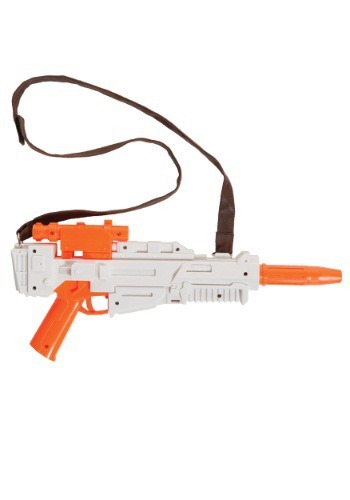 This officially licensed piece comes equipped with an easy-to-use shoulder strap, so you can dodge blaster fire from stormtroopers and infiltrate the Starkiller base without having to worry about losing your weapon. Best of all, it makes the perfect accessory to an awesome Finn costume... and if you still need help putting yours together, be sure to check out our wide selection of Finn-related items!